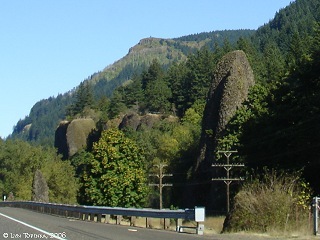 Click image to enlarge Pillars of Hercules, as seen from Bridal Veil, Oregon. 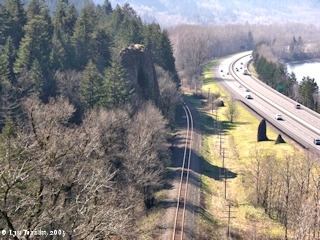 View is looking west, with the one of the Pillars of Hercules on the left (mostly hidden in trees), train tracks and Interstate 84, and the Columbia River on the right. The southernmost pillar is out of the picture to the left. At one time this 120-foot-high column of basalt was a training site for mountain climbers. Image taken March 6, 2005. The "Pillars of Hercules" were two towering basalt columns located on the Oregon side of the Columbia River at River Mile (RM) 131, just downstream of Bridal Veil Falls and just upstream of Crown Point and Rooster Rock. At one time the Union Pacific rail line went between two columns of basalt. Today the line is on the north side of the pillars. Photographs in the University of Washington Library by A.H. Barnes shows the tracks were moved sometime before or during 1913. The 120-foot-high column once served as a training site for mountain climbers. Good views of the Pillars of Hercules can be had from the Bridal Veil Overlook. 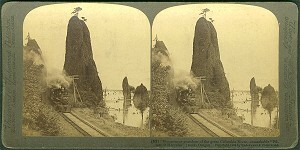 Early photographs of the Union Pacific trains and the "Pillars of Hercules" often label them as the "Needles". Early newspaper articles used the name "Needle Rocks". Another name for the two rocks were "Speelyei's Children". The tracks of the railroad initially ran through the two Pillars of Hercules before being moved to the north of the rocks. Early photographs and postcards of the Pillars of Hercules show the rail tracks running between the Pillars. Photographs taken by A.H. Barnes (University of Washington Library) are dated 1913 and show the rail tracks on the north side of the Pillars. The former track between the Pillars is visible but grass covered. Click image to enlarge Penny Postcard: Pillars of Hercules, Oregon, ca.1910. Penny Postcard, ca.1910, "On the Columbia River". View shows train tracks through the Pillars of Hercules. San Francisco and Portland S.S. Co., Columbia River Route. In the private collection of Lyn Topinka. Click image to enlarge Pillars of Hercules, as seen from Bridal Veil, Oregon. Image taken October 11, 2004. "Stereocards" (also known as "stereoviews", "stereo pairs", or "stereographs") were popular in the late 19th century and early 20th century. Families spent evenings together sharing the 3-D views. The cards consisted of two slightly different images, taken simultaneously with a special camera, and then mounted side-by-side on a card for viewing. Specially designed "stereoscopes" were used to view the cards. Click image to enlarge Stereocard: Pillars of Hercules, Oregon, 1902. Stereocard, Copyright 1902, "Picturesque grandeur of the great Columbia River -- remarkable "Pillars of Hercules" (west) Oregon." Published by Underwood & Underwood. Card #52. In the private collection of Lyn Topinka. Click image to enlarge Penny Postcard: Pillars of Hercules, Oregon, ca.1908. Penny Postcard, Postmarked 1908, "Pillars of Hercules, on Columbia River, Oregon.". View is looking east. The bluffs of Bridal Veil can be seen in the background. Card is postmarked June 17, 1908. Card #U.S.530. In the private collection of Lyn Topinka. Click image to enlarge Penny Postcard: Pillars of Hercules, Oregon, ca.1910. Penny Postcard, ca.1910, "Pillars of Hercules on O. R. & N. Railroad.". Published by Sprouse & Sons, Tacoma, Washington. Printed in Germany. In the private collection of Lyn Topinka. Click image to enlarge Penny Postcard: Pillars of Hercules, Oregon, ca.1910. Penny Postcard, ca.1910, "Pillars of Hercules, Banks of the Columbia River". 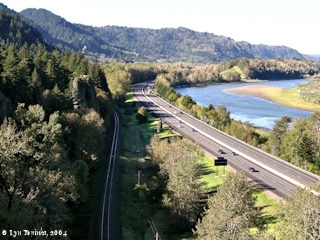 The bluffs of the Bridal Veil area can be seen in the background. Published by Portland Post Card Col., Portland, Oregon (Made in Germany). Card #7054. In the private collection of Lyn Topinka. Click image to enlarge Penny Postcard: Pillars of Hercules, Oregon, ca.1910. Penny Postcard, ca.1910, "Pillars of Hercules, Columbia River, Oregon." Card #7225. In the private collection of Lyn Topinka. Click image to enlarge Penny Postcard: Pillars of Hercules, Oregon, ca.1910. Penny Postcard, ca.1910, "Pillars of Hercules, Columbia River." Published by Louis Scheiner, Portland, Oregon. In the private collection of Lyn Topinka. Click image to enlarge Penny Postcard: Pillars of Hercules, Oregon, ca.1919. Penny Postcard, Postmarked 1919, "Pillars of Herculkes, Columbia River Highway, Oregon.". View shows tracks after their move to the north side of the Pillars. Published by Chas. S. Lipscheutz Company, Portland, Oregon. Card #330. Card is postmarked August 18, 1919. In the private collection of Lyn Topinka. Caption on back reads: "Pillars of Hercules. The Highway here presents a splendid view of those Columnar basalt formations known as the 'Pillars of Hercules' which were no doubt thrust upon the earth by some violent volcanic disturbance in the distant past. By the ancients, the rocks of Gibralter and the Atlas Mountain guarding the Mediterranean Sea, known then as Atlantes, and regarded as the entrance into the unknown, were called the Pillars of Hercules. This fanciful name seemed very appropriate to those old pioneers following the trail along the Columbia River and between the larger pillars. The tree on the crest of the larger pillar stands over 40 feet in height and is perhaps one hundred years old."